Supply Chain Newsmakers Video Series: Should Companies Do More to Identify Supply Chain Fraud? Should Companies be Doing More to Combat Supply Chain Fraud? 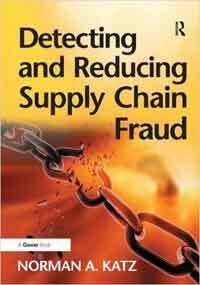 Supply chain fraud - of various types - is a large and growing problem that many companies are doing little to combat. That is the interesting view of Normal Katz, CEO of consulting firm Katzscan and author of the book Detecting and Reducing Supply Chain Fraud. • Supplier-related fraud in terms of substituting materials and related activities. • What might be called "transactional fraud" committed by employees, customers, suppliers and more, in intentional actions to gain financial advantage. How big a problem is it, and what if anything can be done about it? Please watch SCDigest editor Dan Gilmore and Katz discuss interesting topic, excerpted from our weekly Supply Chain Video News broadcast with CSCMP this week. Have a question for Katz on this topic? Send it Here and we will forward it on for a personal response.